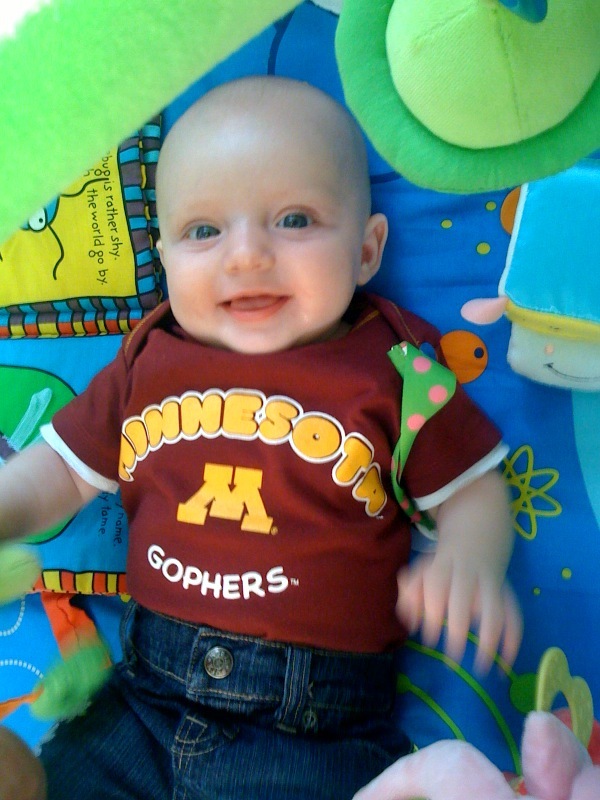 This entry was posted in Adventure, Lil' Nibbler and tagged gopher onesie on July 28, 2009 by marcandjenn. I now weigh 14 lbs, 4 oz (75th percentile) and my height is 24.5 inches (50th percentile). I am getting so big. I’ve started sitting up with assistance and I love to smile and laugh, especially at my big brother, Bug. Soon I’ll be chasing him around the room. I can’t wait! 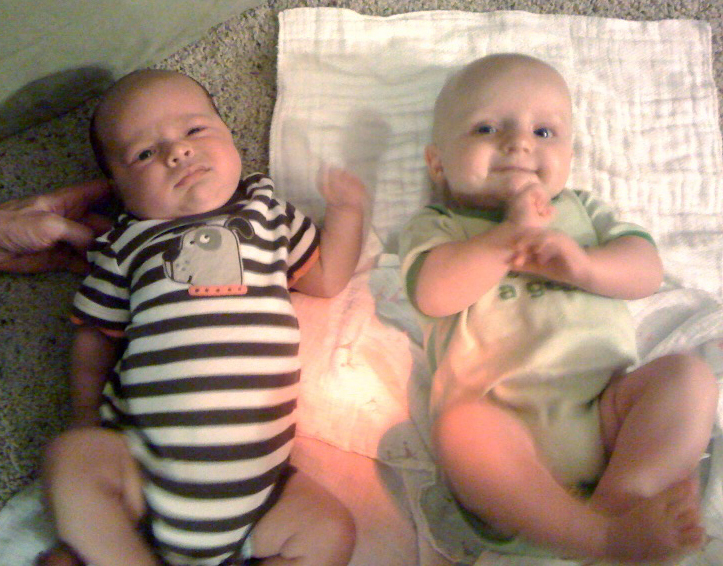 This entry was posted in Lil' Nibbler, Milestones and tagged 4 months old on July 24, 2009 by marcandjenn. Here are some more photos of my trip to Denver. There’s Kellen showing me showing me which toys I can play with; Kellen with his faux hawk (it’s so cool that he has hair! ); Kellen looking a lot like cousin Charlie; the two of us at the liquor store (! ); Kellen showing off his walking style for the camera and for Auntie Christy; Auntie Joy and I showing off our dimples; and Benjamin and I with Aunties Joy and Kari. I miss them already! This entry was posted in Lil' Nibbler, Outings and tagged Benjamin, Cousin Kellen on July 20, 2009 by marcandjenn. I just got back from a long weekend in Denver. I stayed with my cool cousin Kellen. He can crawl all over the place and is almost walking. I also had lots of fun with my Aunt Julie and her friends, including Auntie Becky, who Mommy has known since she was 12. She’s Benjamin’s Mommy. He’s only 6 weeks old but almost as big as me! Isn’t that silly? This entry was posted in Adventure, Lil' Nibbler, Milestones and tagged Benjamin, Denver on July 19, 2009 by marcandjenn. I love my new tie-dye shirt. G & G Nibs found it in New York. Peace. This entry was posted in Uncategorized on July 12, 2009 by marcandjenn. I was getting really sick of just lying around all the time and am a very happy girl when I get to stand up. I have a hard time standing on my own, so Daddy put together my Baby Einstein Exersaucer thingy. I love it. Officially, I’m not quite big enough for it yet, but I had fun pushing the buttons to hear the animal sounds. There’s even a dragon puppet on the other side. Pretty soon I’ll be big enough to really enjoy it. This entry was posted in Uncategorized on July 6, 2009 by marcandjenn. To celebrate we went to my friend Maddie’s house and she taught me how to play hockey. Thanks Maddie! This entry was posted in Uncategorized on July 3, 2009 by marcandjenn.